Fur & Feathers 500 - a Canada Big Year for Birds and Mammals: 125 Birds and Mammals - 1/4 of the way! 125 Birds and Mammals - 1/4 of the way! Today, all four of us birded together for the first time since our east coast trip. It was another sunny Alberta day although somewhat cool - temperature was -12 C with a brisk wind. Our main targets were Harris's Sparrow and any falcon. 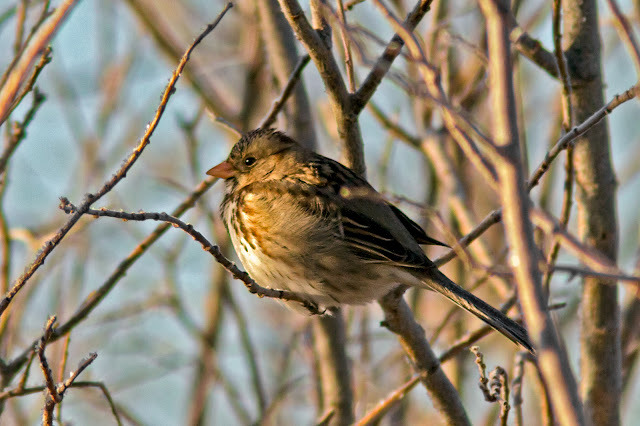 The Harris's Sparrow was first reported on the Calgary Christmas count and has been seen by a number of observers including Mike and Ray at separate times (to count as a team bird, we require at least 2 team members to see the bird while birding together). We arrived at the site in SE Calgary at 8:30 and, initially, the only birds around were Common Redpoll and House Sparrow. A pair of Gray Partridges were flushed and then we came across a mixed flock which contained the Harris's Sparrow, Red-winged Blackbirds and a White-crowned Sparrow. Flush with success, we stopped for a coffee and Phil noted that we were only a couple of minutes away from Bob Lefebvre's place where a Varied Thrush has been spending the winter. 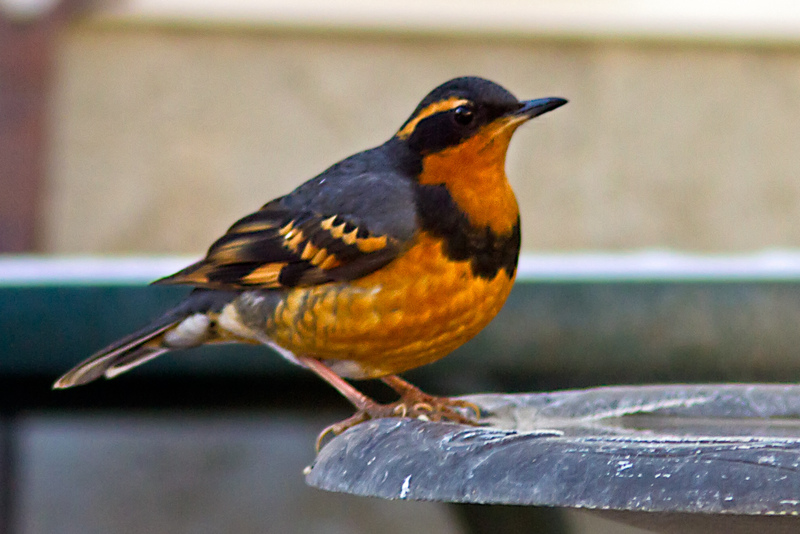 We headed to Bob's and found the Varied Thrush soon thereafter ... we felt we were on a roll. To make a long story short, the roll ended right there and we had no luck with falcons. With the four new species today, we have recorded 115 birds and 10 mammals for a total of 125. We are pretty much on track for the birds but mammals are lagging a bit. I've been enjoying your posts, because one day I would love to go on a Big Year too (I'm 14). Good luck with your year! I'm glad you got the thrush. I'm sure you'll see that species again, but maybe not in Calgary. I haven't seen the Harris's Sparrow since we initially found it in December, despite five trips to that area. As for mammals, have you considered going out for the Northern Flying Squirrels in the Weaselhead? Usually pretty easy to get if you know where and when. Bob, thanks for letting us look over your fence. As you can see, we had stunning views of the Varied Thrush, which was there when we arrived. There was also a Great Horned Owl in the spruce tree on the west side of the street, opposite your back alley.